The season has started (thank God) and we finally have some game action to process. For redraft fantasy football leagues, roughly 10-15 percent of the season is already over. The same is true in dynasty. but the ramifications of any moves made go beyond this season. Any trade you make because of the first two weeks could not only affect this year’s title hopes but next year and beyond. So with that dramatic introduction, let’s see which players are playing above and below their current dynasty ranking. As always, we’ll provide the PFF fantasy staff dynasty rankings in parentheses. It continues to be a crime how undervalued Rivers is. Third in passing yards and passing touchdowns over the last five seasons, Rivers is also the only quarterback in that span to throw for at least 4,200 yards and 28 touchdowns each year. Yet, I’m still having to console people who were “disappointed” at taking Rivers in redraft. The perception is worse in dynasty, where I drafted him as the 22nd quarterback in a startup this off-season. 22nd! Yet, here we are and Rivers is a top-five fantasy quarterback again, averaging over 300 yards and three touchdowns per game. So what about going forward? The knock on Rivers — in dynasty circles at least — is his age. He’ll be 37 before the end of this season, so he won’t last forever. But if you view your dynasty window as anything beyond 2-3 years, you’re doing it wrong. So many things change — players, teams, etc. — that it’s impossible to assume the players you have now will be there (and still good) five years from now. Remember Calvin Johnson? Exactly. Verdict: Buy. With Rivers, you have a quarterback showing no signs of slowing down and surrounded by a core of players that will remain in LA for the foreseeable future. Both Drew Brees (39) and Tom Brady (41) are older than Rivers and still turning in QB1 seasons. Rivers should be available for cheaper than what a quarterback 10 years younger would cost yet he’s capable of winning weeks for your dynasty team. About the only player on the Chiefs offense to not benefit from Patrick Mahomes’ hot start is Hunt. He has just 124 rushing yards the first two weeks and, worse, has just one catch (albeit for a touchdown). Through two games, he’s just RB25 in standard scoring leagues and RB30 in PPR. It’d be a natural reaction to wonder if the ascension of Mahomes has sapped some of the fantasy relevance of Hunt. After all, Hunt may not reach the 270-plus carries he had last year simply because the Chiefs don’t need that to win. But that doesn’t mean Hunt is a lesser player. and he can still have a lot of dynasty value. He’s just 23 and the clear starter on a good, young offense. Any concern about sharing the load with Spencer Ware was for naught as Hunt has outcarried him 34-4. And if Week 2 was any indicator, Mahomes can easily spread the ball around the offense, meaning a big receiving game for Hunt is around the corner. Verdict: Hold. It’d be way too early to write off Hunt and assume he can’t be a RB1 for your dynasty team. The Chiefs offense is on pace for an ungodly, and record-setting, amount of points and will be intact for at least a few years. Give me the starting running back on that team any day. Ajayi’s career has been all peaks and valleys. Initially thought to be a high draft pick out of Boise State, a degenerative knee issue caused alarm among teams, dropping him to the fifth round. He was drafted by the Dolphins, where he played behind Lamar Miller his rookie season, but apparently well enough for Miami to let Miller walk. The job was seemingly Ajayi’s until Miami signed a washed-up Arian Foster to start the 2016 season. Luckily, Miami quickly realized the error of its ways, eventually turning the keys over to Ajayi, and he racked up over 1,200 and eight touchdowns his sophomore year. But another valley ensured the next season where, after totaling over 400 yards in just eight games, he was shipped off to the Eagles. All he did there was see less action but be much more productive on his way to winning the Super Bowl. The point of all of this is to say Ajayi is due for another valley. He’s picked up where he left off last year as the lead Eagles back, rushing as many times as the next three Eagles backs. He’s scored three times, is RB10 in standard scoring and RB16 in PPR and is averaging a healthy 5.4 yards per carry since the trade. But there’s just too many unknowns keeping him as a player I’d want over the next 2-3 years. He’s 25 and in a contract year. Obviously, it’d be in Ajayi’s interest to stay with the team that breathed life into his career but I can’t see the Eagles in a hurry to re-sign him. They’re way over the cap for 2019 as it is and backup Corey Clement, who’s both cheaper and younger, is playing just as effectively as Ajayi even if it’s not nearly as much. Verdict: Sell. Take advantage of the good start for Ajayi in order to get a future piece. Even with him likely missing Week 3, his surface numbers should make him sellable. No doubt Ajayi has a good 2018. It’s just 2019 and beyond I worry about. 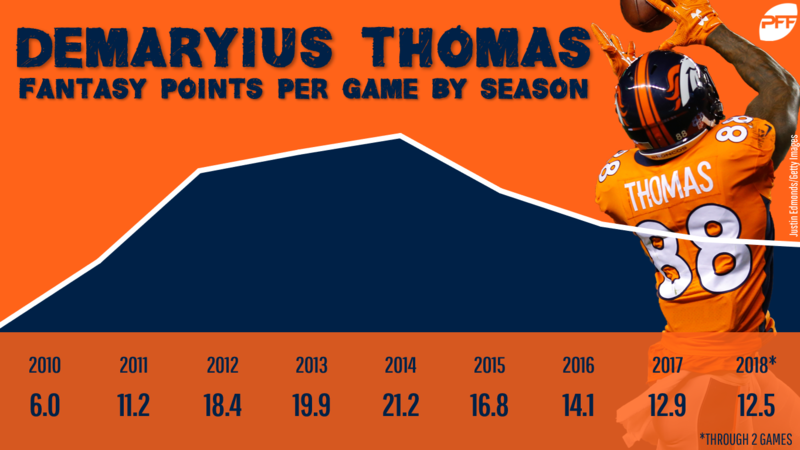 There was a four-year stretch (2012-2015) when Thomas was a bona fide top-10 dynasty player, averaging right at 100 receptions per season, 1,446 yards and 10 touchdowns. Sure it coincided with Peyton Manning’s time there, but that doesn’t take away from the dominance Thomas flashed. Fast forward to post-Manning Thomas and he’s been … meh. Sure, he’s averaged 86 receptions for over 1,000 yards but he’s been nothing more than a low-end WR2 for fantasy purposes. That’s where our rankers currently have him, but there are signs that it may be time to move while you still can. For example, Thomas has steadily been slipping in yards per route run. He was second in the league in that category in 2014, slipped to eighth the next year, 16th the next, 19th the next. Additionally, his yards per reception of 12.0 and 11.4 the last two seasons have been the two lowest of his entire career by at least a half yard. Verdict: Sell. Trade him now while he still has value. He’s currently just 45th among receivers in standard scoring and 36th in PPR but a healthy ninth in targets through two weeks. However, Thomas is already 30 and very expensive going in to next year. Meanwhile, the Broncos drafted receiver Courtland Sutton in the second round of this year’s draft and he’s already joining Thomas and Emmanuel Sanders in three-wide sets, playing five fewer snaps than Thomas and the same amount as Sanders. Before the season, no tight shot up dynasty rankings faster than Burton. A longtime backup in Philadelphia, the Bears gave him starting tight end money in free agency and, with it, sky-high expectations. After all, Burton was expected to fill the same role Travis Kelce did under new coach Matt Nagy who was calling plays in Kansas City last year. No one was mistaking Burton for a top-tier tight end but he was easily ranked as a low-end TE1. So far, Burton has failed to even meet those expectations. He’s just the 16th-highest-scoring tight end in standard scoring leagues and 18th in PPR after totaling just five catches through 35 yards through the first two games. If it wasn’t for a touchdown against Seattle, it would look even worse. It’s early but his yards per reception of 7.0 and catch rate of 50 percent would all be career-lows by a wide margin. Verdict: Hold. Burton wouldn’t fetch a good return and with the rate of tight ends getting injured, he might actually live up to that low-end TE1 ranking by default. For our last look, we’re going to play a new game — a takeoff of a game many of you might have played during those magical years of puberty. This version is called Buy, Sell, Hold, and today we’re going to look at the trio of Tampa Bay Buccaneers wide receivers that have been on the literal receiving end of Ryan Fitzpatrick’s torrid start. Buy: Chris Godwin (PFF dynasty rank: 44) — Still just 22, this may be the last reasonable chance to obtain Godwin in a trade. Our PFF rankers have him ranked 44th, but he’s currently a WR24 in standard scoring leagues and WR30 in PPR. For many, the signs were there that Godwin would be fantasy relevant after finishing 13th in yards per route run last year out of over 100 receivers with at least 32 targets. His 2.03 YPPR was better than fantasy studs like Stefon Diggs, Davante Adams, and many others. He’s young and extremely cheap (relative to his fellow Bucs receivers) and already seeing as many targets as DeSean Jackson. Sell: DeSean Jackson (PFF dynasty rank: 67) — It’s a great story, but the odds are extremely low that Jackson can keep up his current pace of 2,200 yards and 24 touchdowns or even finish with half of that. For starters, he’s 32 years old and hasn’t played a full 16-game season since the 2013 season when he was in Philadelphia. Could he provide value for someone right now in your dynasty league? Sure. The Tampa offense appears legit even if Jackson can’t keep up his historic pace. But he’ll be 33 next year and would save Tampa $10 million against the cap next year.